The resurgence of J. R. R. Tolkein's The Lord of the Rings has been inspired by director Peter Jackson's epic movies with the third instalment, the Return of the King opening on the 26th of December 2003. The gaming world has also seen a boom of Lord of the Rings based merchandise from arcade action games to in-depth role-playing adventures but neither of these games have actually shown the true scale of the battles that plague Middle Earth... until now! The Lord of the Rings: War of the Ring (now known as War of the Ring for this review) is the latest game to handle the franchise that uses the extremely powerful Warcraft III engine to retell the tale of Frodo Baggins and the one ring. On first glance of the game, one could be excused to think that this is actually Warcraft but as you soon start to indulge in the storyline, you soon discover that this is in fact Middle Earth and not the world of Azeroth. Depending on which campaign players choose from, gamers have a variety of races at their disposal that include the mighty humans of Gondor to the Deadly Orcs of Sauron and various other denizens of Middle Earth such as the demonic Balrog. In its essence, War of the Ring is a real-time strategy that combines elements of various role-playing games with a touch of arcade goodness to help with the mix of this enriching title. There are two campaigns that are available in this title, that of good or evil. Gamers who select the good campaign start off in the Misty Mountains and follow various members of the fellowship that include Gimli, Legolas and Boromir before they gather at Rivendale. The game also recreates key battles in Middle Earth such as Helm's Deep and other important moments of Middle Earth history. On certain missions, the player must gather resources to create their towns such as ore and food. There are also a variety of units that you can create from the stock standard soldiers to the deadly ring wraiths as you embark on your campaigns. After finishing the twenty missions that is spread over two huge campaigns, gamers can also indulge in a very in-depth multiplayer mode that ensures that this game will be played again and again. The missions of the game are varied and challenging that range from rescue missions to resource building and of course epic battles between the armies of Middle Earth. As with Warcraft III, War of the Ring also contains "hero" units that have various powers and abilities that are vital for completing missions and help add to the RPG element of this title. War of the Ring unfortunately suffers from some very unstable artificial intelligence that is a combination of cunningness and stupidity. 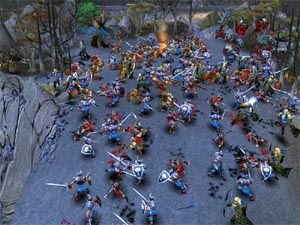 Graphically, War of the Ring is almost identical to Warcraft III and considering that it's the same engine is not such a bad thing after all. The entire gaming world of the game appears to have been taken out of a Saturday morning cartoon with simplistic yet stylised polygon created characters. The powerful 3D engine that powers this game is amazing and everything from the backgrounds to the character interact with each other flawlessly. 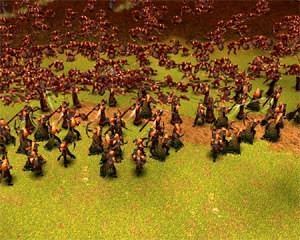 As with Warcraft III, gamers can zoom into the heart of the battle to see their warriors battle the evil orcs or the peaceful and noble elves. The game also contains some brilliant special effects from power spells, amazing shadow and lighting effects, beautifully created water effects and even moving trees as the winds of Middle Earth brush the leaves of these ancient pines. The game also uses the in-game graphics engine to move the story along nicely to help tell the tale of good versus evil. 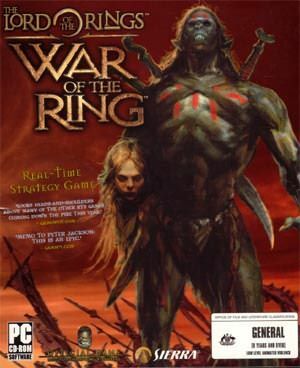 Unfortunately, War of the Ring does not contain any pre-rendered cutscenes that graced Warcraft III and it would been a really nice addition if this was included in the title. Musically, War of the Ring is brilliant and although it is distinctly different than the movies, it still has that majestic feel that really helps you become thoroughly immersed into the world of J. R. R. Tolkein. The game also uses professional voice acting to tell the tale of our heroes, whether it is Legolas or Gimli, each character has a distinct voice that perfectly suits the character they play. There are also various background sounds and of course the sounds of deadly battles on the scorched lands of Middle Earth. In conclusion, The Lord of the Rings: War of the Ring is a different perspective of the J. R. R. Tolkein's Middle Earth saga that not only does the story justice but also gives gamers a run for their money with exciting missions, an in-depth storyline and amazing graphics and sound. 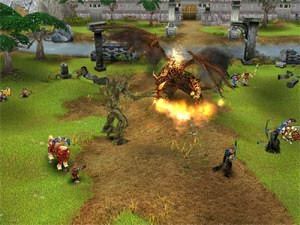 Finished the Warcraft III saga? Then you better check this one out then!